Why is a child theme important in WordPress? You install WordPress, choose a good-looking theme for your site, install it but there is something that is missing from the theme. You want to make customization but can’t do it easily in the theme you installed because you know, your edits will be lost once you update the theme to a newer version. That’s when Child themes comes in handy. Child theme’s main purpose is to allow you to add your customization and edits in a way that won’t be lost if ever the parent theme that you use send in any new updates. Whether using free WordPress themes from worpress.org repository or buying a premium theme from marketplace like Themeforest, most of these comes with some form of update mechanism. When there is a new update, you get a notification in your WordPress dashboard and with one click the files of your theme are replaced with new version. In such a case if you have added customization into the core files of the theme then those files will be replaced by the new version that the theme author sends with update. So, to not lose your hard work it’s always best to us a Child Theme to add your customization and edits. Creating child themes in WordPress very easy. You can either do it manually by creating a new theme folder in your themes folder or by Using Child Theme Wizard plugin. A child theme by default consist of two files from the parent theme. Create a new folder inside wp-content/themes folder and name it something unique like “sitename-child”. Make sure there are no spaces in the name or else it will throw an error while activating the theme. Now, Modify the code with details relevant to your theme. Theme URL: Add your sites url. Description: Add a small description about the theme. Author URL: You can add your URL here. Template: This is the most important part. In the field you will have to write the exact folder name of your Parent Theme. If for an example, you are creating child theme of Twenty Fifteen then write “twentyfifteen”, If you are using some other theme then adjust accordingly. Version: Start from 1.0.0 and update this line with every update you make to your theme. The above example function will only work if your Parent Theme uses only one main style.css to hold all of the css. If your child theme has more than one .css file (eg. ie.css, style.css, main.css) then you will have to make sure to maintain all the Parent Theme dependencies. If you child theme’s style.css also has custom css then you will have to enqueue that file as well. Failure to use the proper tag will result in a CSS file needlessly being loaded twice. This will usually not affect the site appearance, but it’s inefficient and extends your page’s loading time. Now, your child theme is ready to be activated. Upload your child theme to your WordPress Dashboard and activate. You may have to re-save your Menu items, widgets and customizer options if you have added any new menu, widget or customizer panels. Go to your site’s Dashboard > Plugins >> Add New and search for the plugin called “Child Theme Wizard”. Install it and activate it. The Child Theme Wizard lets you create a new child theme without the need for additional tools, right from within the WordPress admin interface. Once activated, you can find it under Tools – Child Theme Wizard. Specify a parent theme, customize options such as title and description and click Create Child Theme. Upon success, you will find your new theme under Appearance – Themes. 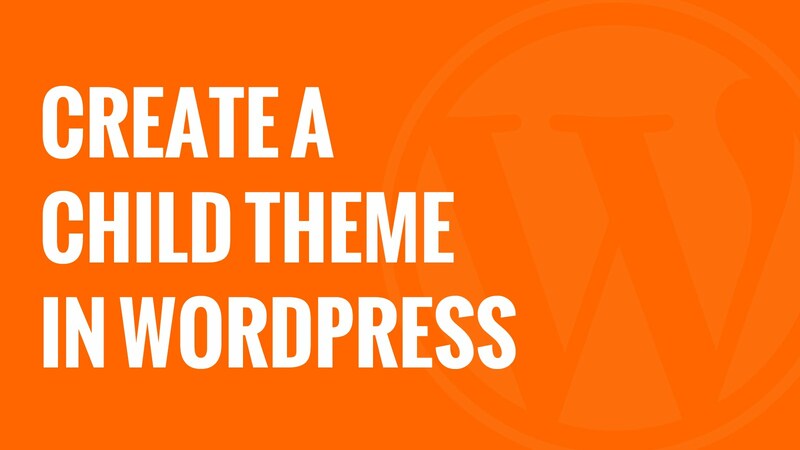 It’s generally a good idea and a recommended one to create a child theme if you want to customise your WordPress site. Modifying core theme files which you know will be replaced in future updates is a bad idea and that will waste a lot of your time and resources. Build child themes and make your WordPress site free from future update problems. How to make colored admin table by Post Status in WordPress ? According to a recent survey readers today only spend less than 15 seconds reading a blogposts before they leave never to come back. This is because our attention time in today’s world has been going down and down and we have too many things going to keep us distracted. If your content is not engaging and does helps the readers in anyway then they quickly jump to another site to look for something new. To keep users on your own site you can showcase them your best work after they have finished reading the blogposts they have landed upon. Once a reader has read your blogposts and think you have something they can use then start looking for more content in your site and what better way than to show them more posts from own blog right after they have finished reading the current posts. Best way to keep users engages is to show them more related news below your posts. Below are 10 Best WordPress Related Posts Plugin to show more posts from your own blog content. Get visitors reading more of your posts and trafficking more pages on your site by installing the AddThis Related Posts WordPress plugin. With AddThis, you can recommend your site’s most popular content, and what’s most relevant to your visitors. Widgets and shortcodes are available for this plugin. You can also use our optional analytics to discover how your content is performing. Shareaholic is the world’s leading all-in-one Content Amplification Platform, which includes related content recommendations, social sharing, following, social analytics and site monetization apps such as promoted content, native ads and affiliate links. This module makes it a snap for any website — big or small — to engage and grow their traffic, market their content, gain insights, and monetize their audience, all from one powerful but easy-to-use dashboard. All our Apps are designed to work well together, on any website. Increases pageviews, engagement and time on site by highlighting relevant content that may not otherwise be discovered from across your site. Shareaholic is not just yet another related posts content plugin. It involves a simple installation that’s easy to update and tweak. You’ll be using well-engineered and optimized code that won’t slow or block your pages from loading. An advanced and versatile algorithm: Using a customizable algorithm considering post titles, content, tags, categories, and custom taxonomies, YARPP finds related content from across your site. Related posts (aaa+) Yuzo is intended to show related post plugin as accurate as possible, also has multiple features with more customization options +60 much as structure as design. Also in this new version features a super widget to display related or the best post your wordpress blog. This fast to use and configure intuitive and the best thing is free. Displays related post your stories with different features of text and image size. Do Remember that related posts plugin add extra queries into your single posts and if you tons of posts than using these plugins could effect your site speed. Always use caching while using any of these plugin and test out various plugins to see which one works best for your site. If you would like us to feature any other related posts plugin that you know off, then leave a comment and let us know about it.